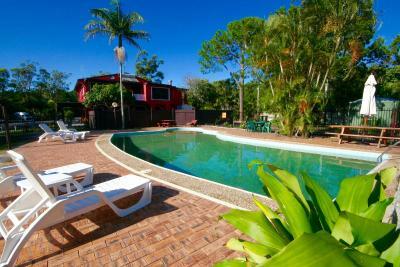 Lock in a great price for Ingenia Holidays Byron Bay – rated 8.1 by recent guests! Easy late check in, great and clean room! Perfect for family or friends trip! The accommodation had everything to make you feel comfortable. Very well equipped kitchen and even milk and cookies. The children's playground that was in front of the cabin. Warm water was ok. The staff was friendly. There are free board games and books you can lend from the reception, which was nice. The studio was clean and the kitchen was equipped pretty well for home cooking. The villa was very clean and great locations few km drive into the main part of town. Staff are very friendly and helpful. Despite it being a caravan park it was very peaceful and quite at night. The cabin was quite good, although a little old. 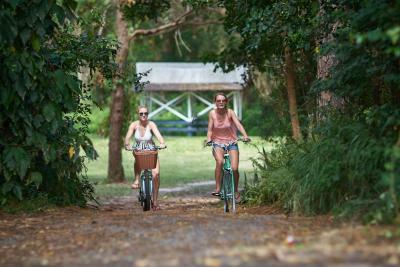 The location was convenient for our purposes and it was in a very nice, quiet area with easy access to the beach. There was also an on site cafe which we didn't use but it was nice to know it was there if we needed a coffee or breakfast as the park is about a 15 minute drive to town, unlike the park's materials which says it's just a 5 minute drive from town. Quiet and peaceful. 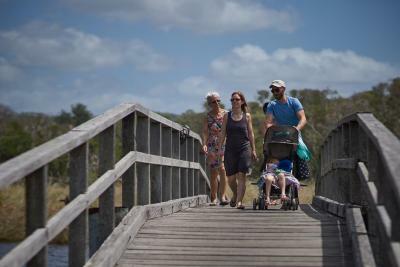 Great walk to Tallow beach. Very good cafe/restaurant privately owned at front. 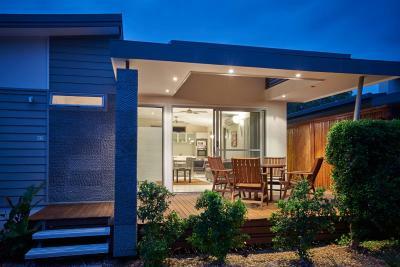 Ingenia Holidays Byron Bay This rating is a reflection of how the property compares to the industry standard when it comes to price, facilities and services available. It's based on a self-evaluation by the property. Use this rating to help choose your stay! 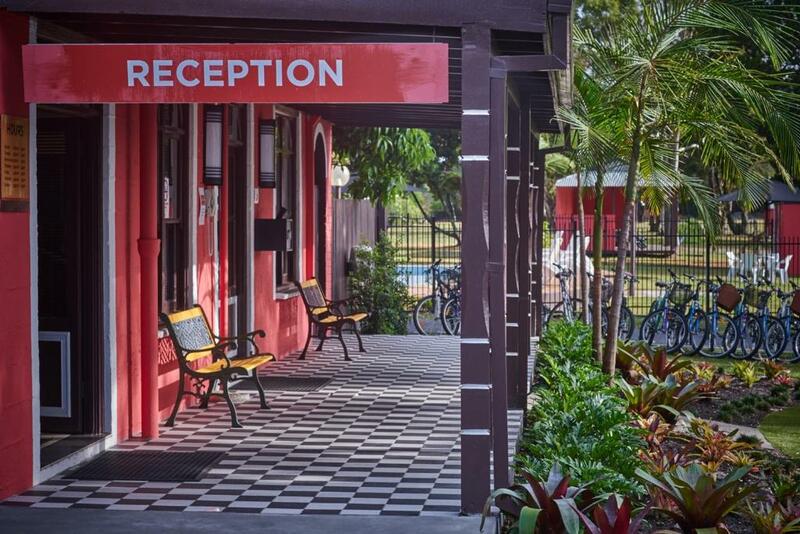 Offering an onsite swimming pool, free parking and a children's playground, Ingenia Holidays Byron Bay is located next to Tallow Beach. 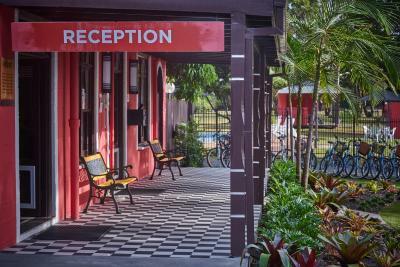 Ingenia Holidays Byron Bay is just 5 minutes' drive from Byron Bay town center, Cape Byron Lighthouse, shops, bars and a wide range of restaurants. All accommodations offers a TV, a dining setting, linen for all beds and a bathroom. 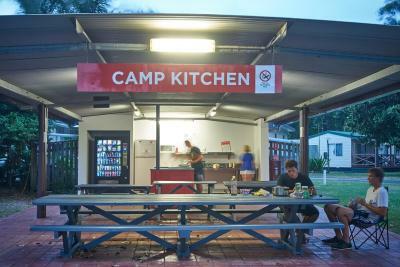 Some accommodations offers a fully equipped kitchen with an oven and dishwasher. 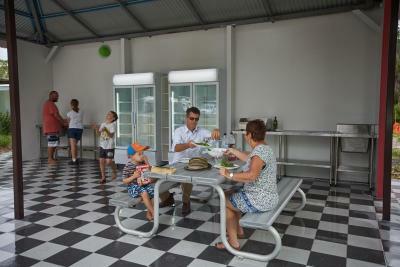 There is a communal kitchen and an outdoor dining area with BBQ facilities. 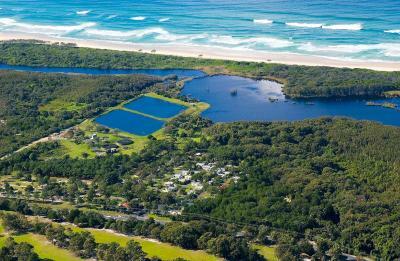 The nearest airport is Ballina Byron Gateway Airport, 11 mi from Ingenia Holidays Byron Bay. A shuttle service to the property is available at the airport. 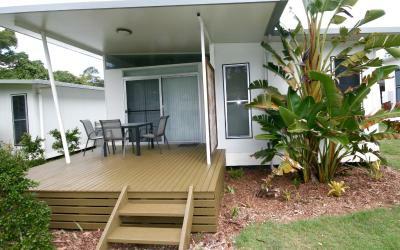 When would you like to stay at Ingenia Holidays Byron Bay? This air-conditioned villa features a balcony and a dining area. Please note that pets cannot be accommodated in this villa. This villa features a balcony, a dining area and a fully equipped kitchen with a dishwasher. This studio has a balcony, microwave and toaster. Please note this room can accommodate small dogs under 10kg, on request only. 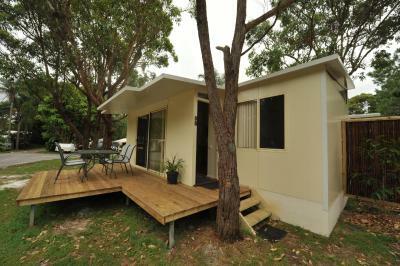 Please contact the property for more information, using the contact details found on the booking form. This studio features a microwave, toaster and electric kettle. 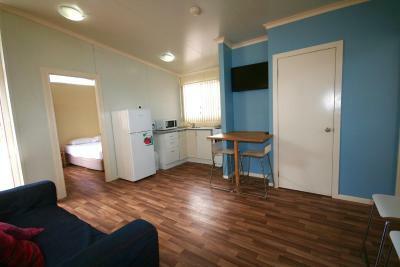 This air-conditioned, open-plan studio offers a kitchenette with a cook-top, microwave and refrigerator. There is a modern bathroom and all linen is provided. 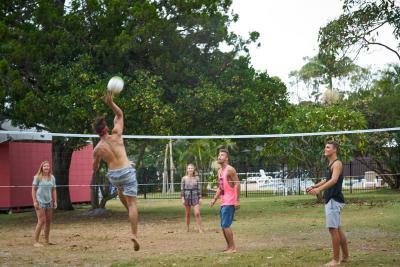 House Rules Ingenia Holidays Byron Bay takes special requests – add in the next step! Ingenia Holidays Byron Bay accepts these cards and reserves the right to temporarily hold an amount prior to arrival. Please note that this property does not accept payments with American Express/Diners Club credit cards. Please note that there is a shuttle service available at the airport. This can be pre-booked, online with the shuttle service company. Please note the small dog friendly room can accommodate small dogs under 10kg, on request only. Please contact the property for more information, using the contact details found on the booking form. 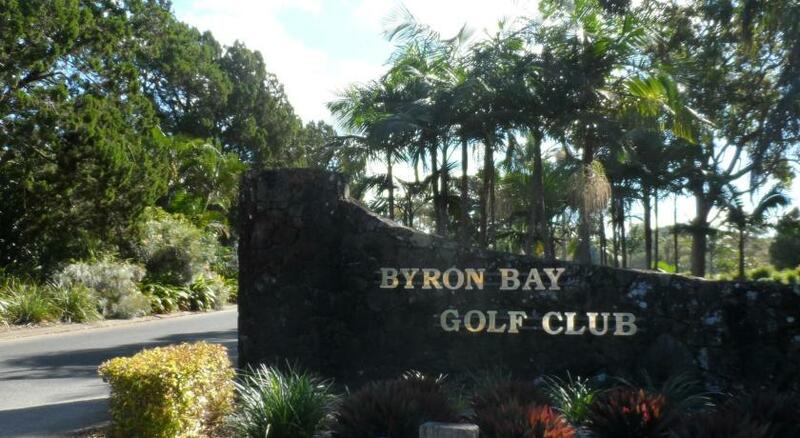 Please inform Ingenia Holidays Byron Bay of your expected arrival time in advance. You can use the Special Requests box when booking, or contact the property directly using the contact details in your confirmation. Cleaner than I expected it to be! Like it was very well kept. The complex was handy to both beach and hinter land. Peaceful and comfy. Couch uncomfortable. Couldn’t close bathroom window and couldn’t cover high windows at night so park and other unit lights came in. Good that you excepted pets. Easy to check in after hours. Friendly staff. Great facilities. Maybe the bathroom was small but still OK.
Good location close to the beach and other facilities. Easy to move around / park up. Facilities in the room were good and everythiong was clean and working. The facilities was basic and the bed was a bit soft. The place was convenient if you have a car and well organised. The lighting in the Belongil Villa is terrible, very dim and difficult to see especially in the bathroom. The bathroom doesn't have an extractor fan so if you want a hot shower expect condensation on everything! There was also no where in the shower to put shampoo, soap etc except the floor which I don't recommend as it was mouldy and stained. We had some issues with noise, it seems a large group of "Harley Davidson enthusiasts" were staying at the same time as us so we endured multiple comings and goings of 5+ Harleys.....so relaxing. There was also a door off the kitchen with a small utility room and a back door - this small room was damp and stank of mould which permeated the rest of the cabin. We were only there 3 nights so didn't bother to complain however for those staying for an extended period it would be an issue. There was a small café on site selling overpriced food, at $19 for a small pizza we decided on delivered dominos for 1/3 price. 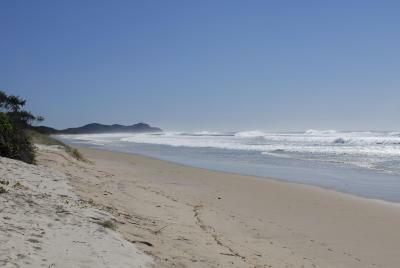 Also, the beach (Tallows) has a very dangerous undertow so DO NOT swim!! Room wasn't ready at 1.40pm which is fair enough. We were told we would get a text message when ready however never received one so decided to head back around 4.00pm. The rug inside was completely damp. Once it was night time and we turned out lights, cockroaches started to appear. Many of them. We were on the brink of leaving but it was stormy weather and a two hour drive to get home with two little kids in tow. The bed was comfortable and linen clean however we couldn't sleep well knowing how many cockroaches there were. At one point to walk to the bathroom after turning on the light several scampered away but they were over the table with our bag and wallet on it. The bugs droppings were over the bath mat the next morning as well. It's a shame about the cockroaches as it dampened our stay here. The park is in in a good location and we were able to bring our dog. Fans in bedrooms would have been great. Nothing else. Good stay. Location good. Cafe at entrance excellent. Cabin comfortable.